Sunday morning was a moment I’ve been waiting a long time for. My heart was more ready for it than I anticipated, and as I returned to my seat from that moment – and paused to say my own Thank You…my eyes began to leak. It was nothing tragic, or remotely upsetting. In fact, it was far, far from it. Since being able to make St. Paul’s my church home, and worshipping there on a regular basis – today was my first opportunity to be part of the communion meal (outside of Christmas morning). It’s funny, I hadn’t realized how much I missed celebrating communion with my beloved, until I was anticipating it on this particular morning. To be sharing in the mystery of the covenant we have been invited to with the one I love most in this world, and with my new Church Family, it was indeed a very holy moment. My devotional readings lately added to the depth and significance for me. My outlook on life and willingness to watch for all the way God intersects in my day-to-day life has been changed because of Ann Voskamp and her book, “One Thousand Gifts”, as well as her blog www.aholyexperience.com I am re-reading the book right now, savouring all of it – digging deeper into the scriptures that she references, letting the words soak into my very being. 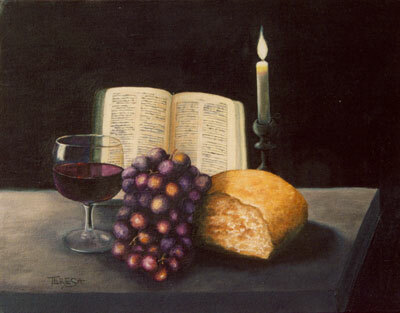 Eucharisto – this living in true communion with Jesus, begins with giving thanks – Jesus himself models this for us on so many occasions including the night he shared bread and wine with his friends. Recognize the words? Jesus invited us into a covenantal relationship with him at the last supper A deep relationship with the care and loyalty a spouse vows to have. So, with this in my head, and thankfulness in my heart, I set out walking to God’s house with my beloved. Yet one more sign that God was with me as we walked…I was hearing strange things, like raindrops on leaves, yet it wasn’t raining! Or at least not on us – we were walking ahead of the rain, staying very dry, yet I marvelled at the wetness behind us. Sheltered, that’s the way I was feeling. As sheltered as I know Jeff keeps me in uncertain situations, because we share that covenant. As we came forward for the elements of the celebration, we were singing, and as I returned to my seat, and bowed in thankful prayer – my eyes leaked. Leaked with overwhelming thankfulness. For the joy of worshipping with my new church family, for the honour of sitting under Jeff’s teaching again, for the seamless way my two jobs, which I love, blend together, for the gift we remember with each communion and for the love and care of a Creator and Saviour that I don’t for a minute deserve.